The reel is a folk dance type as well as the accompanying dance tune type. Of Scottish origin, reels are also an important part of the repertoire of the fiddle traditions of the British Isles and North America. In Scottish country dancing, the reel is one of the four traditional dances, the others being the jig, the strathspey and the waltz, and is also the name of a dance figure (see below). In Irish dance, a reel is any dance danced to music in reel time (see below). 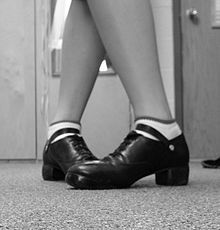 In Irish stepdance, the reel is danced in soft shoes and is one of the first dances taught to students. There is also a treble reel, danced in hard shoes to reel music. The reel is indigenous to Scotland. The earliest reference was in a witchcraft trial of 1590, where the accused was reported to have "daunced this reill or short dance." However, the form may go back to the Middle Ages. The name is probably of Old Norse origins, cognate with Suio-Gothic rulla, meaning "to whirl." This became Anglo-Saxon hreol and Gaelic ruidhle or ruidhleadh, which is the origin of the word now. After being introduced to Ireland in the late eighteenth century it thrived. Later it was introduced to North America by English, Scottish, and Irish colonists and immigrants. In the United States, reels remain central in the traditions Anglo & African American Old-time music and square dancing, as well as Cajun and Zydeco. In Canada, they are important parts of Cape Breton, Quebecois, and Métis repertoires. 4 time in English, Welsh, Scottish & Irish Fiddle Tunes, with no change to the note lengths. 2 time signature. Like most dance music originating in the British Isles, reels are usually composed in binary form, meaning they have two parts (A and B); in most reels each part is repeated (AABB), but in others it is not (ABAB). Each part (A and B) typically has eight bars, which in turn are divisible into four-bar and two-bar phrases. (An exception is the "auld reel" of Shetland which tends to irregular structure and may have been influenced by the Norwegian halling.) The example of Jimmy Shand performing Mairi's Wedding follows the pattern ABABB, giving a pattern of 40 bars. The group of 32 bars (four times eight) is itself repeated three or four times before a second reel is introduced. The grouping of two or more tunes in medleys or "sets" is typical in Celtic dance music. Today many Irish reels are supplemented with new compositions and by tunes from other traditions which are easily adapted as reels. It is the most popular tune-type within the Irish dance music tradition. ^ Haigh, Chris (2013). Exploring Folk Fiddle. London: Schott. p. 11. ^ Haigh, Chris (2009). The Fiddle Handbook. Hal Leonard. ^ Krassen, Miles (1976). O'Neill's Music of Ireland, New & Revisited. p. 158. ^ Williamson, Robin (1976). English, Welsh, Scottish & Irish Fiddle Tunes. p. 69. ^ "Jimmy Shand – Mairi's Wedding". YouTube. Retrieved 7 April 2015. Wikimedia Commons has media related to Category:Reels (dance). This page was last edited on 30 September 2018, at 14:06 (UTC).